'The Magician' Shaun Murphy could not stop 'the Captain' Ali Carter to be taken off! The defending Champion lost to Carter by 3-6. Carter successfully took the first frame with 58. The three frames afterwards were close. Safety and small breaks are commonly found in these frames. Carter took the first three before Murphy pull one back with 55. It is 3-1 before mid session. The good form of Murphy did not continue after mid session ended. The Captain extended his lead to 4-1 with 87. Murphy gave a very good response, 93 in the next frame. However the Captain is getting stronger to make a 101 to reach 5-2. The Magician showed his magic in the key time. When Carter hits 61 while Murphy is 45 points behind, Murphy reduced to 37:61. Some good snooker is followed, Murphy got enough foul points to win the frame by 71:63. Carter did not give Murphy plenty chance in the next frame. He caught a mistake by his opponent to finish winning 6-3. Tomorrow will be his first appearance in the final of Wuxi Classic. The opponent of the Captain was either Mark Selby or Ding Junhui. 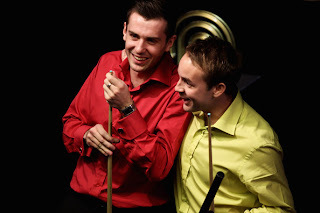 Eventually Selby won the drama in decider despite Ding cameback from 2-5 down. Selby took the first frames by making a few quality snookers. Ding caught a chance left by Selby to make 55 in the second frame, also took the mistake well to get the third frame. Ding led for the first time in the match, 2-1. Selby hit 81 to level 2-2 before mid session kicked off. The Jester continued his good form after mid session. Opened by 134 in the fifth frame, Selby stole the seventh frame as well to lead 4-2. Ding still could not find a chance in the eighth frame. He could only be a viewer to watch Selby knocked 64 to get the match point, 5-2. Ding Junhui started his hard fightback. The Chinese Hero saved 2 match points by 71. The difference was only reduced to 1 frame, 4-5. Ding made a mistake when he led 40:0 in the next frame followed by 61 from Selby. Don't you think Selby could win easily? In fact, Ding cleared all the colours to force a respotted black. This black determined if we had any decider! Ding did not disappoint the crowd by potting the respotted black! Ding came from 2-5 down to force a decider. What a dramatic match it is! All the pressure was on The Jester. But The Jester did not shake, he kept his steady performance in the decider. First he made 61 and 21 after the fighting of colours. Mark Selby locked in Ding Junhui by 6-5. Selby made a maximum break here in 2009 and being a runner-up in 2008. No doubt Selby will become more confident by winning this thriller. Will Mark win it this year? Carter did not trip to China due to sickness last year. This time Carter makes it to the final and it is a good way to start the new season. Will Ali win one more in China after winning Shanghai Masters last September? The first session of final starts at 6am (BST).